Looking for a flavorful yet light brunch idea? 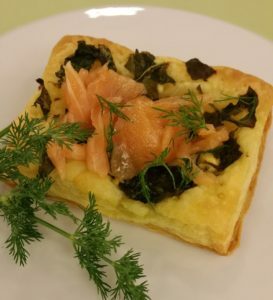 Try this Spinach & Salmon Pastry recipe. I made it recently at a cooking demonstration class at Bloomingdale’s. It’s easy to make and delightfully delicious! Add spinach and toss. Set aside. Place sheet pan in the oven and bake approximately 20 minutes. Remove sheet pan from oven. Using a small tong, place a good wedge of salmon atop each puff pastry. This entry was posted in Appetizers, Baking, Breakfast, Cooking, Cooking Class, Demonstration, Lunch, Recipe, Recipes, Uncategorized and tagged Bloomingdale's, Breakfast, Brunch, cooking, CookingClass, Food, Recipe, Recipes by Janet Davis. Bookmark the permalink.